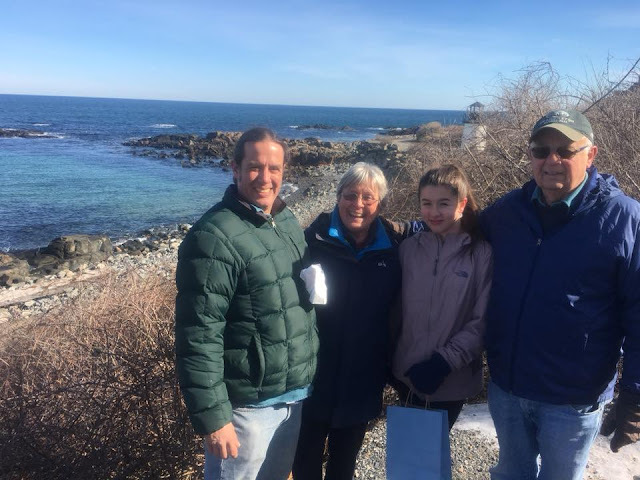 The pictures for this issue of the blog are mostly from before the wedding in New England with a few from after our return. 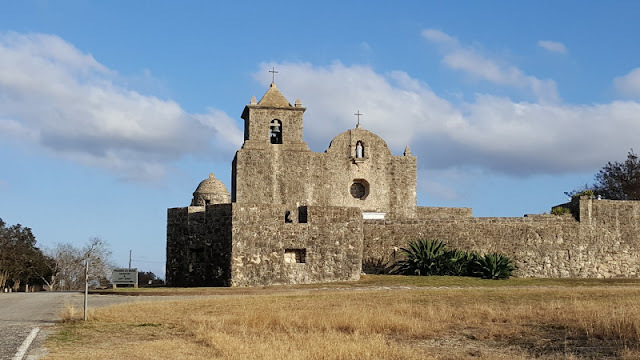 We had been south of San Antonio in Elmendorf to escape the below freezing weather in January. Didn't work. We still had ice. Could not believe they cancelled school for two days because the bridges were frozen one day. 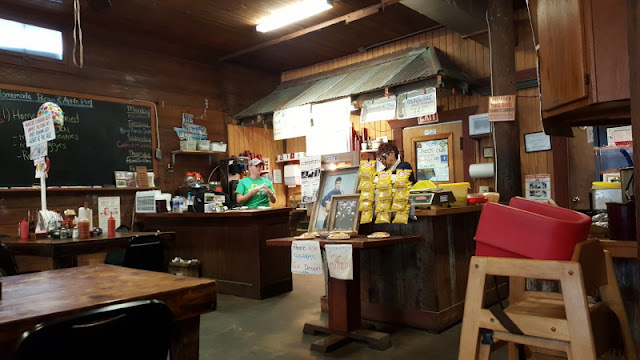 Since we were south anyway, we continued on Route 37 to Choke Canyon State Park, a little west of Three Rivers. 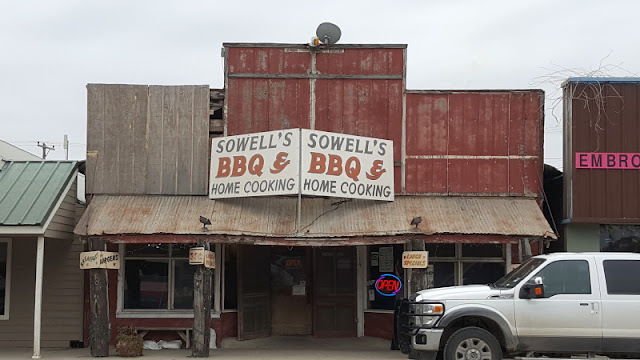 In Three Rivers we had to stop at Sowell's BBQ. As you can see above, it is a homey spot, quite popular, and well rated. We picked up a bunch of brisket to bring to the campground. 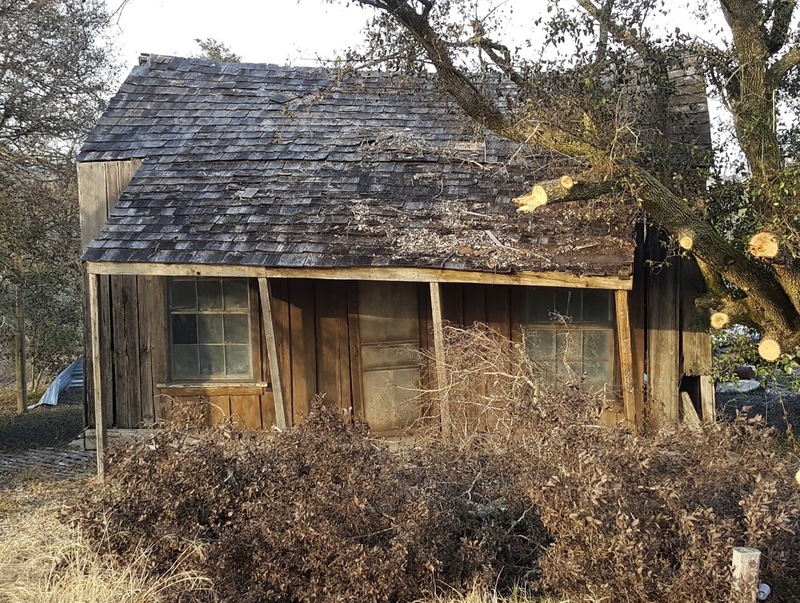 The building may look a little down on the outside, but that is sort of on purpose, to emphasize its age. Built in the early 1900's as a general store and then moved here to serve as a tavern ,The Green Inn Bar, before becoming Sowell's BBQ. Our spot on the lake is very private with great views. 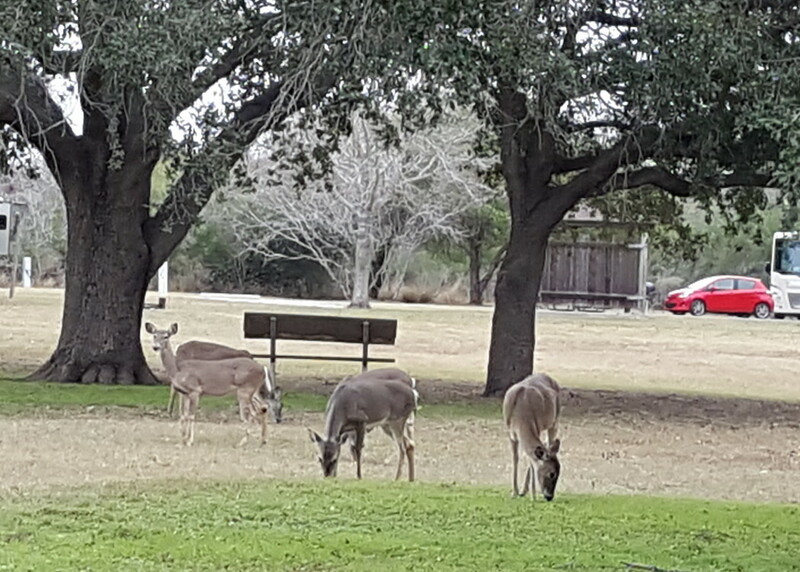 The many deer roam through the campground. 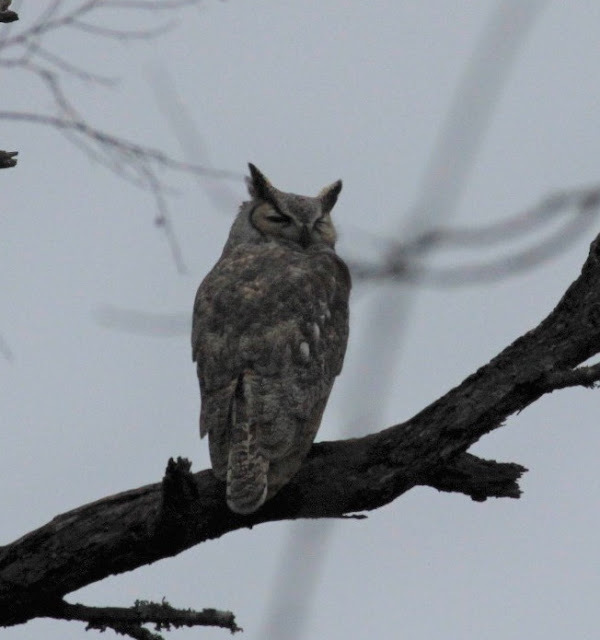 This is the Great Horned Owl from the last blog. Very difficult to get vey close for a picture. 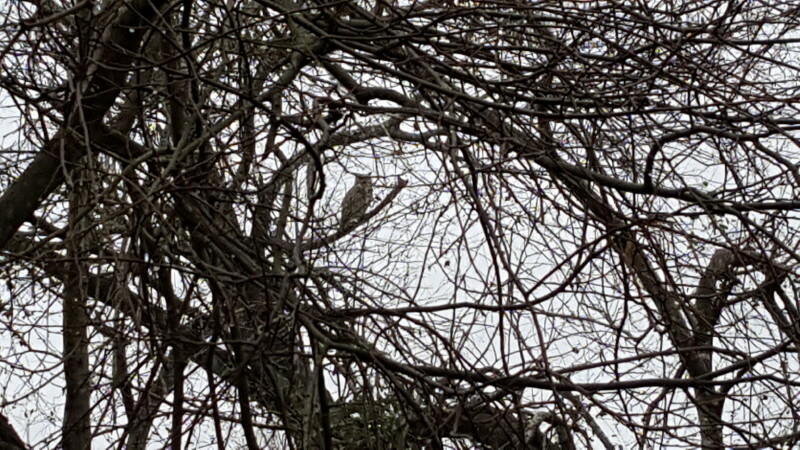 From the road, he was facing us, but blocked by branches. 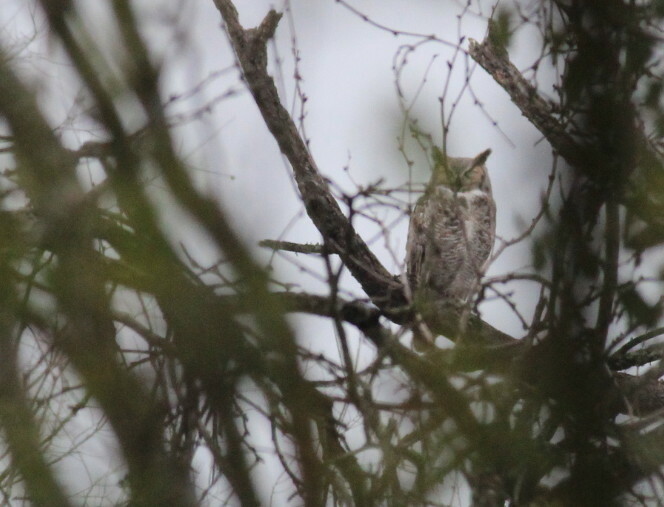 So, we reverted to deception and a telephoto lens to make him turn around and look at us. 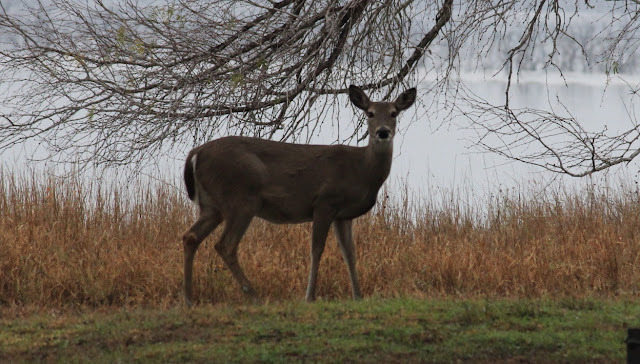 Deer are alert, but not skittish. They just roam about and then disappear. 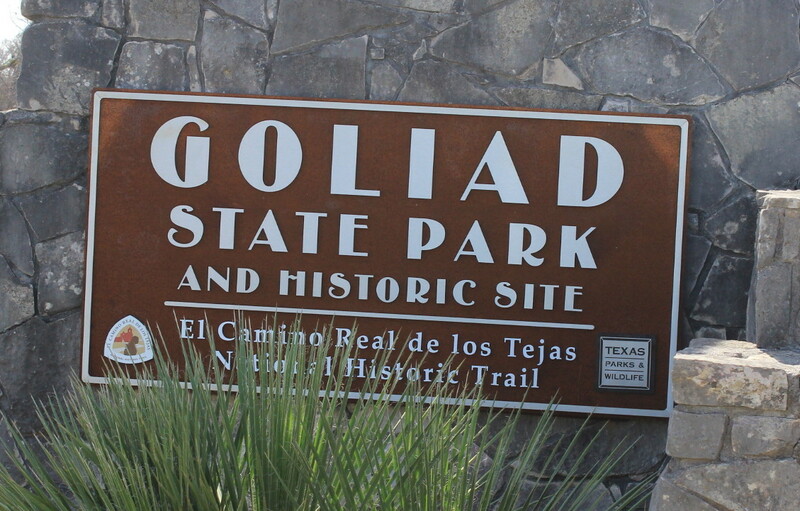 From Choke Canyon, we headed south on Route 281 and then east on Route 59 to Goliad. 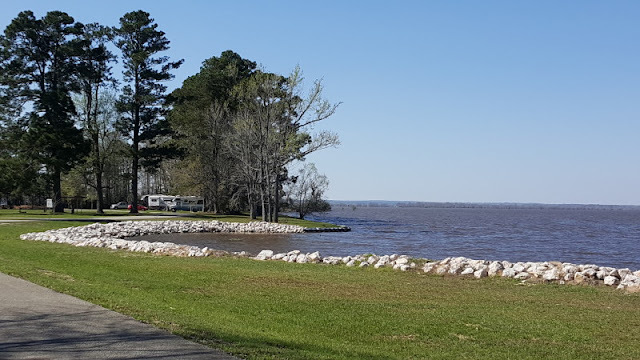 This state park is a historic park. 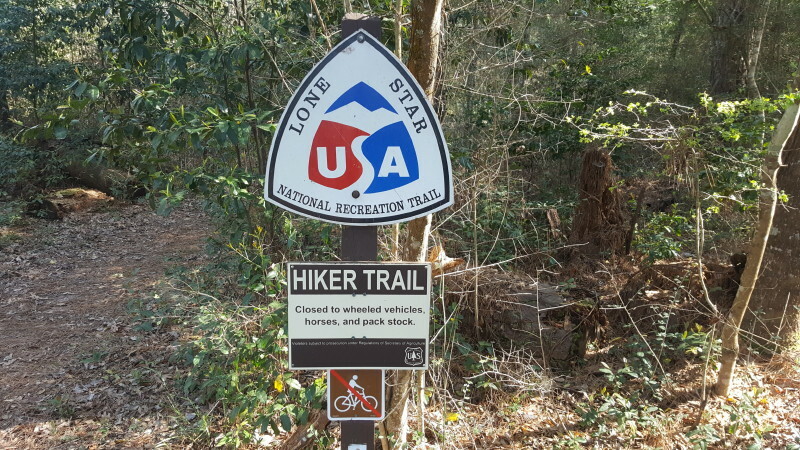 Along the El Camino Real , Texas Historic Trail. A number of people, including campers, use the access to The San Antonio River for 6.6 miles of paddling. 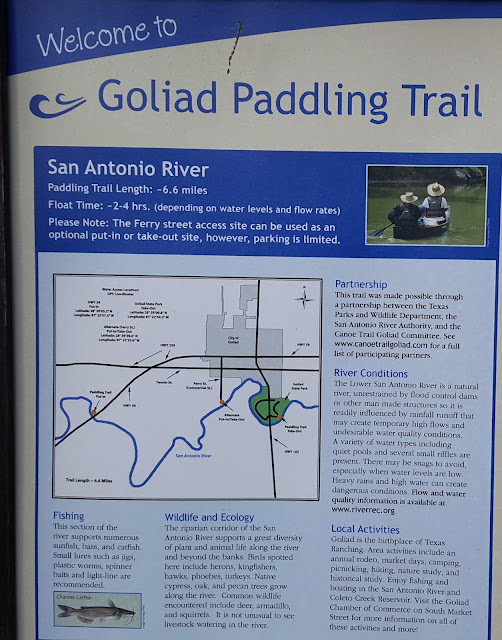 This is part of the Texas Paddling Trail. 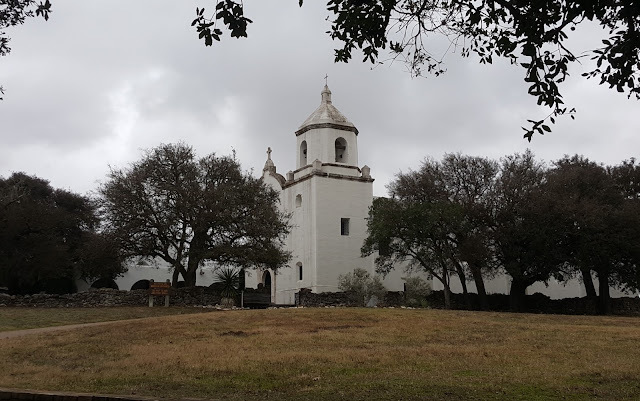 The Presido La Bahia is a fort and museum remaining from the 1700's. The fort played a major part in the Texas Revolution. Plaques here tell the story of Colonel Fannin and his troops who were captured and then massacred at the order of Santa Anna. Later, at the battle of San Jacinto, the battle cries were "Remember Goliad" and "Remember the Alamo" The fort, museum, and grounds are very well maintained by the Catholic Diocese of Victoria. We notice the small details sometimes. 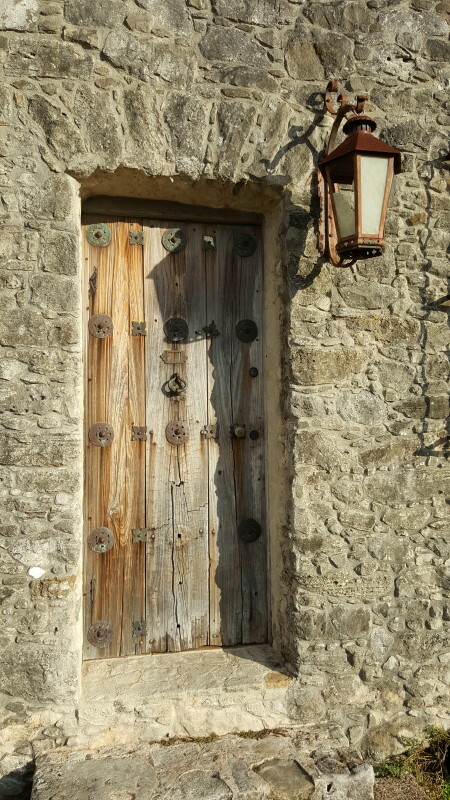 Like this old wooden door. 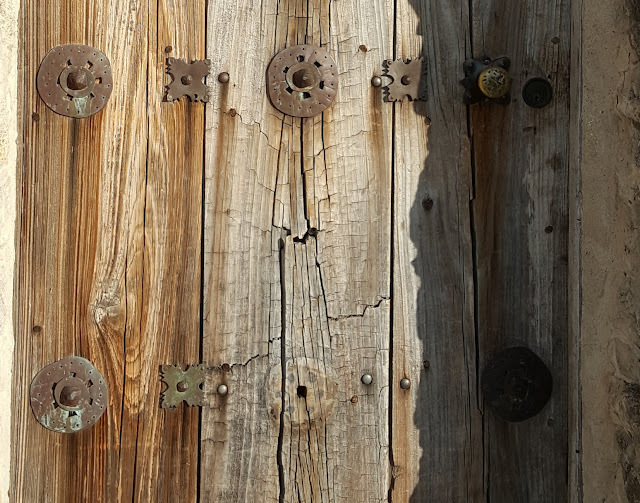 A closer look shows the hand made brass fittings, nails, and door knob with the weathered wood. Nearby, Jan thought this might be her new favorite home. Perhaps a little fixing needed? 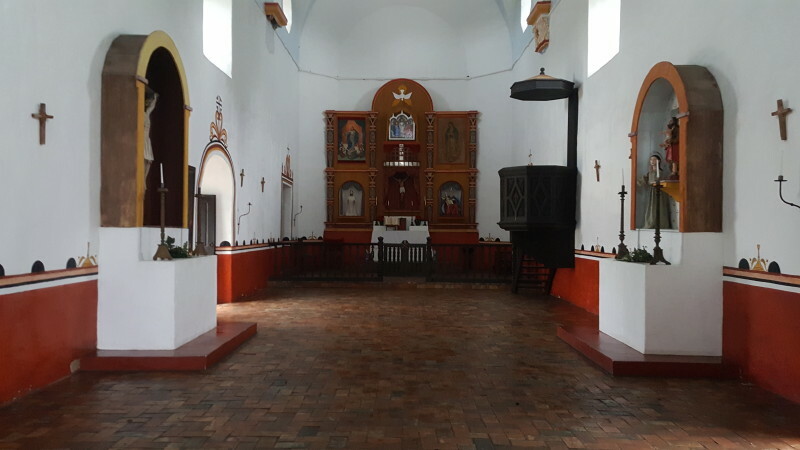 This is the Mission Espiritu Santo also within easy walking from the campground. Moved here in 1749, The Franciscan Missionaries taught the local Aranamas people. The mission created immense herds of cattle that became the early beginnings of Texas Ranching. The inside is quite beautiful and very well maintained. A stock picture from the historic site's collection. From Goliad we head east to Victoria and then north on Route 77 and east on Route 290 for a night at Somerville Lake State Park again. 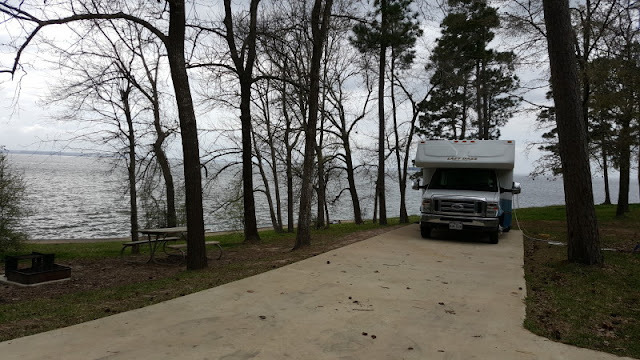 We then head east to Route 45 and then north to Huntsville State Park. This park can be challenging in the main season. Many sites are just not level and can be close together. But here in the off season, it can be quite nice. Even so, Lady Blue is a little off kilter due to leveling. 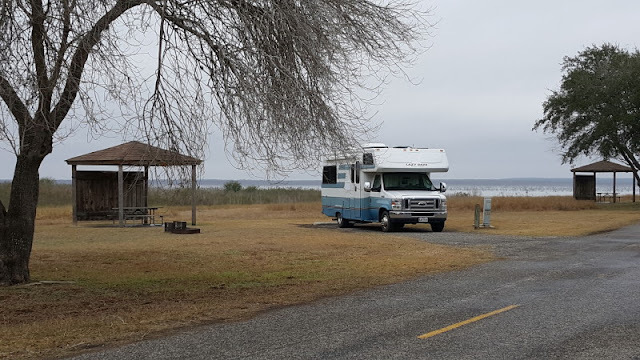 And then back to Lake Livingston State Park. 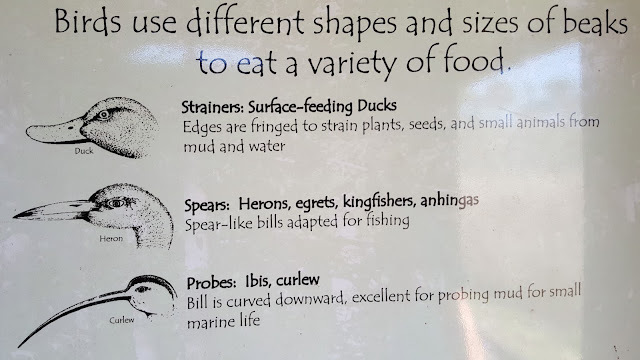 Along the Nature Trail are these signs for types of birds classified by their shape and size of beak. 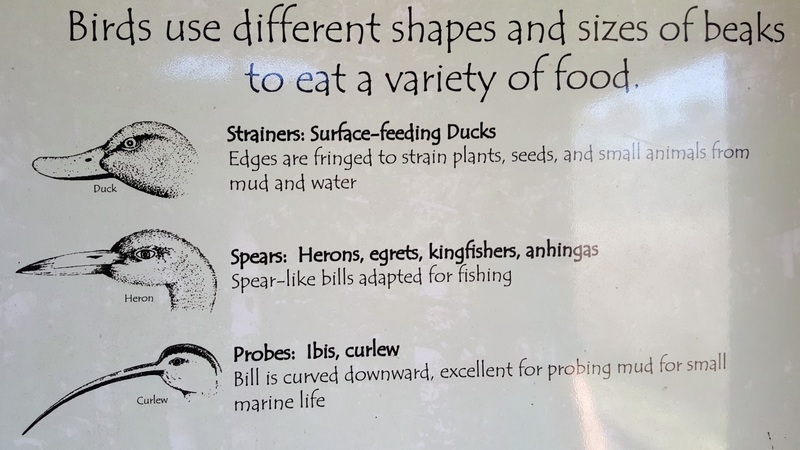 We though of Lucas and wondered if he can name some of the birds for each bill type. 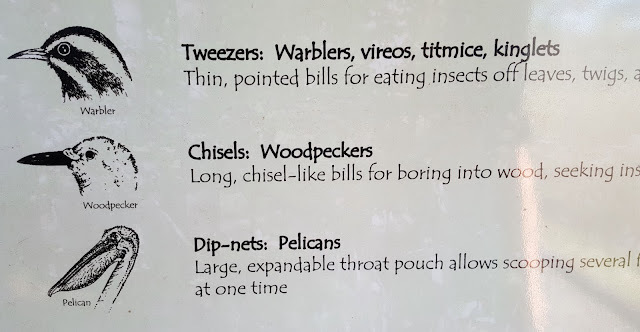 Never thought of birds this way. Also along the trail was this . It is connected at the top to running water through an attached pipe. 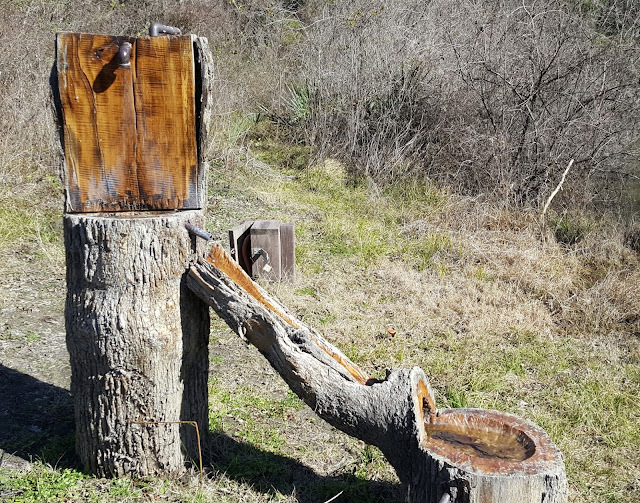 Then the water flows down onto the log and through a maple syrup type tap , through a hollowed out branch and a hollowed out section of that tree. This sign was from the trails at Double Lake National Forest Campground in the Sam Houston National Forest. Back again to Lake Livingston State Park. This time we go first class to a great site on the water. 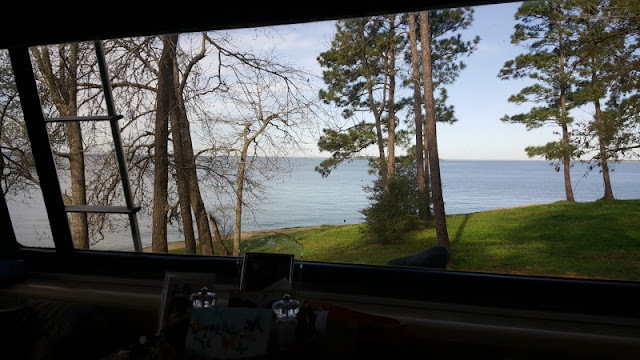 Lady Blue is quite happy to offer this view from the back window. 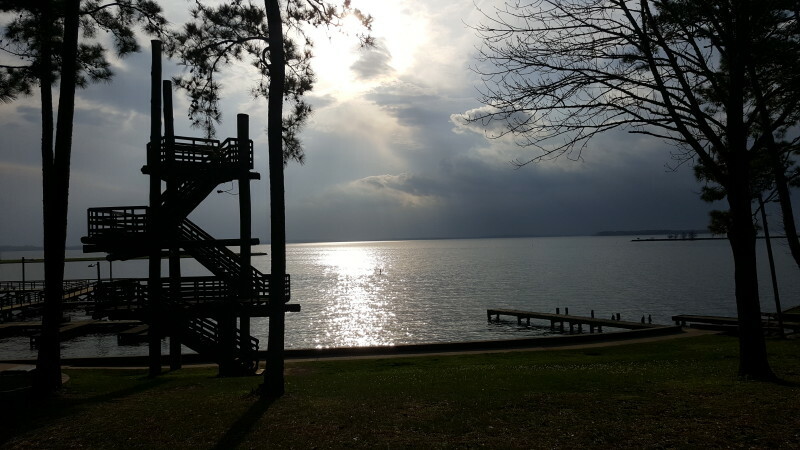 A threatening storm passes north of us across the lake. Heading east now, after the wedding. 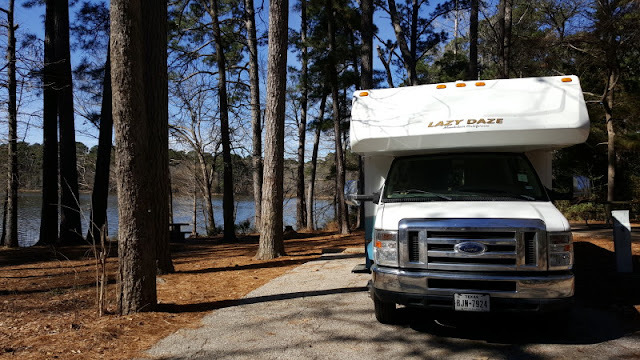 Lady Blue on a water site at Sandy Creek COE park on B. 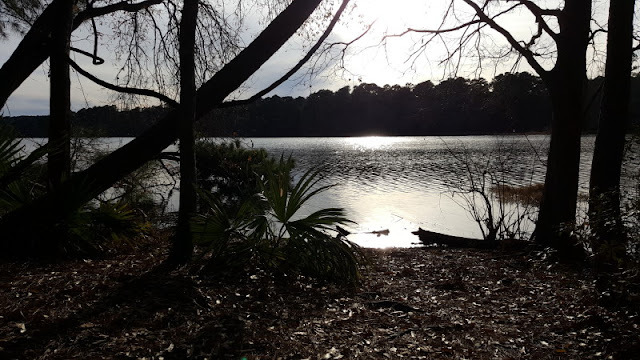 A. Steinhagen Lake. This is east of Livingston on Route 190. A picture from Maine that missed the last blog. Sunset at Lake Livingston from our window. Sunset from Huntsville State Park at our site. Goodbye to Texas for now, and on to Louisiana.